#1; Play as a sweeper keeper out of possession, coming to intercept overhit through balls/clear when needed. Look to play into #5/4 or #6 from goal kicks when possible. If this is not possible play to #2/3. #2/3; A big focus on attacking. Their job is to help support the wide strikers by getting high up the pitch to create 2v1 situations, overlapping when possible or supporting from behind. When out of possession they recover as quickly as possible, either to the ball or if the CB has pulled out wide to deal with the ball recover centrally. Also find times to balance the team and sit back when the opposite full back goes forward. 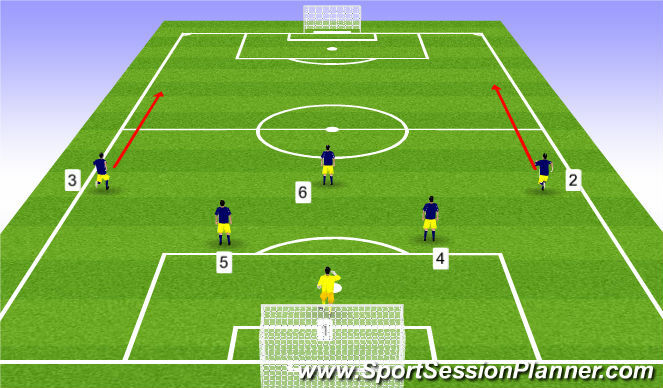 #5/4; Create passing options for GK by splitting wide to the edge of the box. If this is shut off one CB slides down to the 6 yard box and the other tucks in just in case possession is lost. Be available to help recycle possession when the opposition force us back or if we need to draw them out before playing forwards. Deal with 1v1 defending, winning the ball in the air and on the floor, looking to play to CDM/FBs or further forwards. Recognising when we are in danger and when to make tactical fouls to deny counter attacks against us. When outnumbered recognise when to press (bad touch & no danger behind) and when to drop (delay counter attack and allow team mates to get back). #6; Priority is to break up play and move the ball wide or forwards. Should hold a very defensive position to protect CBs and drop in to make a back 3 when needed. Recognising when to rotate with the CM to create space in midfield, ensuring we are unpredictable. Understanding when to stand still to pick up spaces in midfield to get on the ball and switch play.